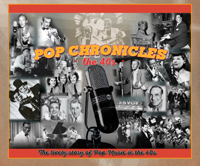 The original Pop Chronicles radio series by John Gilliland telling the story of music from 1940, through the war years right up to the dawn of the 50’s. Told in an interesting and entertaining way with songs, interviews and commentary from everyone who was part of the music scene. Al Jolson, Andrews Sisters, Bing Crosby, Dinah Shore, Doris Day, Ella Mae Morris, Ethel Merman, Frank Sinatra, Harry James, Hoagy Carmichael, Irving Berlin, Nat “king” Cole, Peggy Lee, Perry Como, Ray Eberly, Rodgers & Hammerstein, Sammy Cahn, Spike Jones, Stan Kenton, Tex Beneke, Vaughn Monroe, Walt Disney and many, many more.